Murder, kidnapping and cannibalism. (Cannibalism?) Must be just another day in Tasmania! 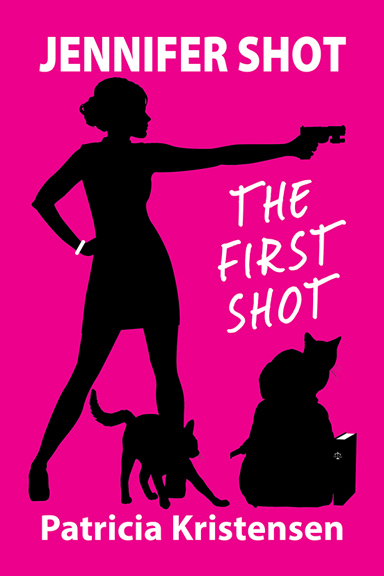 What else could go wrong in the humorous murder mystery Jennifer Shot – The First Shot? herself targeted by a mafia hit man, Chester the Chisel, named after his weapon of choice. To further make ends meet, she rents rooms to Nathan, Rod and Cindy, two oversexed fellow law students, and a police officer with personal issues. When Jennifer’s detective job has her searching for a missing senator’s daughter, she stumbles onto an elaborate mob scheme. Her life is further complicated by an old flame, a new love, a senile aunt and, oh yes, a killer, one who has Jennifer’s murder at the top of his things-to-do list. Who will get in The First Shot? From the first I was attracted by the author’s refreshingly quirky sense of humour. I’m not really one for chick-lit or comedy-with-your-murder plots but Kristensen hits the nail on the head several times in the first few pages. My mother followed my father off the Derwent Bridge three months later. It was not an act motivated by overwhelming grief at my father’s death, but by my mother’s need to always be right. While driving on the bridge, my mother saw people waving and yelling that the bridge was down. As she had crossed it earlier in the day, she saw no reason why it should not be there on the way back. The combination of a big ship and a drunken captain had not fared well for the big structure. The centre of the bridge was torn out, leaving a gaping hole that then claimed the lives of sixty-three people. They drove their cars off the centre of the bridge, plunging into the Derwent River and to their death. My mother was the last to make the fall. The passage helps put a time frame on Jennifer’s life. Jennifer was thirteen at the time she was orphaned. The plot strained the bounds of credibility a bit too much for my liking, narrative passages at times read like they had been lifted from a travelogue (but then Tasmania is a bit out of the way for your typical crime fiction reader, and there’s a lot that needs explaining), but there were redeeming features among some of the quirky characters, and I’m sure this author will have a following. The title gives the clue that this is intended to be the beginning of a series. Indeed it appears that the second, JENNIFER SHOT – ANOTHER SHOT is already in the wings.